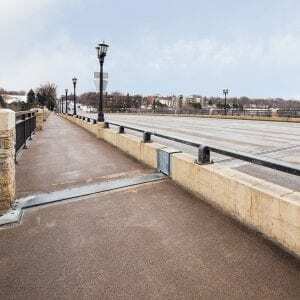 The scope included replacing all of the expansion joints, repairing the limestone veneer, repairing the mini-plazas at the four corners and sealing the concrete deck. Small portions of the bridge deck were removed to install new bridge deck expansion joints, and new concrete was poured. Work was phased with only half of the bridge being worked on at a time to minimize traffic impacts and allowing the bridge to remain fully operational throughout construction. In addition, work also included he removal, cleaning, and replacement of existing utilities. The original project specifications called for three-month project duration and required the custom made modular joints to be sole sourced, which have a ten-week lead time, therefore pushing the work into 2018. The LS Black team leveraged their subcontractor relationships to find an alternate supplier to manufacture the custom modular joints. LS Black then worked with the Owner to obtain approvals to allow an alternate supplier to provide the joints. Through this initial outreach effort and collaboration between parties, the project was completed on-time meeting the expectations of the Owner, City and community.